The Storm Runner, which releases tomorrow, is the first book inspired by Latinx culture under the new Disney imprint Rick Riordan Presents. As in Rick Riordan’s many other series, it features a pre-teen who gets pulled into adventures with various gods and mythological creatures. I was able to talk to J.C. Cervantes about her process writing the book and what it’s like to be part of the Rick Riordan Presents team. Q: How did you get connected with Rick Riordan and his imprint? A: My agent sent me a well-timed email as soon as Disney sent out the Rick Riordan Presents announcement. I happened to have a story in mind that had been lingering in the vault. I nearly squealed with excitement. So, I polished the first three chapters and synopsis and after my agent submitted, we got a call the next day! What was it like working with him? Intimidating. Surreal. Amazing. Terrifying. Thrilling. Humbling. All of the above? Q: The Storm Runner is an adventure novel, whereas your debut Tortilla Sun is a family story set in a close-knit village. Was your writing process for each book different in terms of plotting and character development? A: It was totally different. 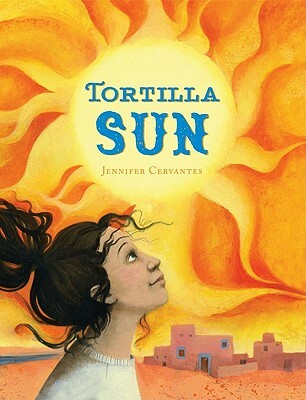 When I wrote Tortilla Sun, I had never written a book before so there was sort of an innocent navigating my way through the thorny dark with no idea where I was going vibe. But I had more experience by the time I wrote The Storm Runner and had already forced (yes, forced) myself to learn how to outline and plot in ways that I had been SO resistant to before. Q: What was your research like for this book, not just the Maya aspects to the story, but also for your protagonist with a physical disability? A: I relied on stories my grandmother told me to get me started and then hit the books (eight plus) to really challenge what I thought I knew. Interestingly, there were discrepancies even between texts. Additionally, I worked with two Mayanists, specifically on language aspects and pronunciation. I also watched several documentaries. One of the great challenges with learning more about the Maya and their pantheon is that most of their ancient written records were destroyed by the Spanish. In terms of writing a child with a disability, it was important to me that his disability not define him, that I be mindful of the visibility and invisibility of his experiences and his feeling that he didn’t belong. So, I drew on personal experience with people/children I know with disabilities, but I also worked closely with a special education scholar who has dedicated her life to teaching and working with kids with disabilities. She read the manuscript as well to ensure I remained mindful and aware of my character and his experience in an authentic way. Q: For kids who read this book and immediately want to learn more about Maya culture and cosmo-vision, what books or resources would you point them towards? There are so many amazing books out there but depending on age range I would recommend the Popol Vuh, The Pocket Dictionary of Aztec and Mayan Gods and Goddesses, The Illustrated Encyclopedia of Aztec and Maya, the Lost History of the Aztec and Maya, and for fun, a picture book titled: You Wouldn’t Want to be a Mayan Soothsayer. There are also some really wonderful videos on YouTube like The Underworld of the Mayan Gods produced by the History channel. Warning: it’s pretty creepy! Q: Middle grade has for a long time been the age category with the least Latinx representation. That feels like it’s starting to change, with high-profile debuts from people like Celia Perez and Pablo Cartaya and now your addition to an imprint from a middle grade superstar. What advice do you have for other Latinx writers who want to write for middle grade readers? A: Begin with what you know, what you grew up with. Tap into the magic that is so prevalent in our cultures and let that carry you through the story. Don’t let anyone tell you that your experience doesn’t matter or isn’t ______ enough (fill in the blank) or doesn’t align with the “norm.” Read loads of books, especially diverse titles, mentor, and support diverse writers. Be authentic. And above all honor the kids you write for. They are smart and funny and so eager to see themselves and their lives reflected in the pages of books. ABOUT THE AUTHORAbout the author: Jen Cervantes is an award-winning children’s author. In addition to other honors, she was named a New Voices Pick by the American Booksellers Association for her debut novel, Tortilla Sun. The Storm Runner‘s sequel, entitled The Fire Keeper, is slated for release in 2019. Keep up with Jen’s books and appearances at her official site. Jen is also a member of Las Musas, the first collective of women and non binary Latinx MG and YA authors to come together in an effort to support and amplify each other’s debut or sophomore novels in US children’s literature. You can learn more about them by here. ABOUT THE INTERVIEWER: Cecilia Cackley is a performing artist and children’s bookseller based in Washington DC, where she creates puppet theater for adults and teaches playwriting and creative drama to children. Her bilingual plays have been produced by GALA Hispanic Theatre and her interests in bilingual education, literacy and immigrant advocacy all tend to find their way into her theatrical work. Learn more at http://www.witsendpuppets.com.